Making changes to your diet is a proven way to help control high blood pressure. These changes can also help you lose weight and lower your chance of heart disease and stroke. Your health care provider can refer you to a dietitian who can help you create a healthy meal plan. Ask what your blood pressure target is. Your target will be based on your risk factors and other medical problems. Eat foods that are naturally low in fat. These include whole grains, fruits, and vegetables. Read food labels. Pay special attention to the level of trans fat and saturated fat. Avoid or limit foods that are high in saturated fat (more than 20% of the total fat is considered high). Eating too much saturated fat is one of the major risk factors for heart disease. Food high in this type of fat include: egg yolks, hard cheeses, whole milk, cream, ice cream, butter, and fatty meats (and large portions of meats). Choose lean protein foods. These include soy, fish, skinless chicken, very lean meat, and fat-free or 1% fat dairy products. Look for the words "hydrogenated" or "partially hydrogenated" on food labels. DO NOT eat foods with these ingredients. They are very high in saturated fats and trans fats. Limit how much fried and processed foods you eat. Limit how many commercially prepared baked goods (such as doughnuts, cookies, and crackers) you eat. They may contain a lot of saturated fats or trans fats. Pay attention to how foods are prepared. Healthy ways to cook fish, chicken, and lean meats are broiling, grilling, poaching, and baking. Avoid adding high-fat dressings or sauces. Eat foods that are high in soluble fiber. These include oats, bran, split peas and lentils, beans (such as kidney, black, and navy beans), some cereals, and brown rice. Learn how to shop for and cook foods that are healthy for your heart. Learn how to read food labels to choose healthy foods. Stay away from fast food restaurants, where healthy choices can be hard to find. 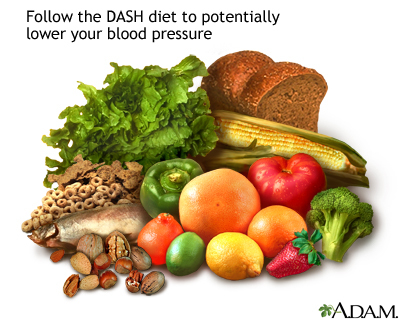 The low-salt Dietary Approaches to Stop Hypertension (DASH) diet is proven to help lower blood pressure. Its effects on blood pressure are sometimes seen within a few weeks. This diet is rich in important nutrients and fiber. It also includes foods that are higher in potassium, calcium, and magnesium lower in sodium (salt) than the typical American diet. Limit sodium to no more than 2,300 mg a day (eating only 1,500 mg a day is an even better goal). Reduce saturated fat to no more than 6% of daily calories and total fat to 27% of daily calories. Low-fat dairy products appear to be especially beneficial for lowering systolic blood pressure. When choosing fats, select monounsaturated oils, such as olive or canola oil. Choose fresh fruits and vegetables every day. Many of these foods are rich in potassium, fiber, or both. Eat nuts, seeds, or legumes (beans or peas) daily. Other daily nutrient goals in the DASH diet include limiting carbohydrates to 55% of daily calories and dietary cholesterol to 150 mg. Try to get at least 30 grams (g) of daily fiber. Check with your provider before you increase the potassium in your diet or use salt substitutes (which often contain potassium). People who have kidney problems or who take certain medicines must be careful about how much potassium they consume. National Heart, Lung, and Blood Institute. Description of the DASH eating plan. www.nhlbi.nih.gov/health/health-topics/topics/dash. Accessed June 29, 2017. Victor RG, Libby P. Systemic hypertension: management. In: Mann DL, Zipes DP, Libby P, Bonow RO, Braunwald E, eds. Braunwald's Heart Disease: A Textbook of Cardiovascular Medicine. 10th ed. Philadelphia, PA: Elsevier Saunders; 2015:chap 44.